Hurricane Katrina was one of the deadliest hurricanes to ever strike the United States and the second Category 5 hurricane of the 2005 Atlantic hurricane season. The storm formed over the Bahamas on August 23, where it moved west and hit south Florida as a Category 1 hurricane two days later. Katrina then crossed over Florida and strengthened into a Category 5 hurricane moving west in the Gulf of Mexico. The storm then turned north, had an eyewall replacement cycle, and hit east Louisiana and Mississippi, flooding coastal areas on the morning of August 29. The leftovers of Katrina then died out over the Great Lakes on August 31. 80% of New Orleans was flooded when the levees protecting the city broke. Most of the people killed by Katrina were thought to have died from drowning. Many of the survivors had swum to higher roofs or tree branches. Hurricane Katrina began as Tropical Depression Twelve over the southeastern Bahamas on August 23, 2005. The depression later strengthened into a tropical storm on the morning of August 24, and was named "Katrina". Katrina continued to move into south Florida, and became a Category 1 hurricane only two hours before it made landfall around Hallandale Beach on the morning of August 25. The storm weakened over land, but became a hurricane again while traveling west across the Gulf of Mexico. Katrina began to gain strength very quickly, moving over the warm waters of the Gulf of Mexico. 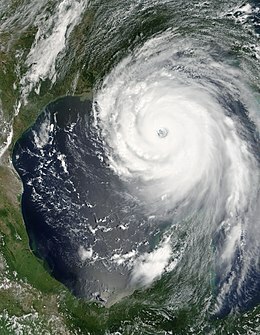 On August 27, Hurricane Katrina reached Category 3 strength on the Saffir-Simpson Hurricane Scale, becoming the third major hurricane of the season. An "eye-wall replacement cycle" once made Katrina stop becoming stronger for a short moment, but made Katrina to become nearly twice as large in the end. Katrina again began to quickly strengthen, reaching Category 5 strength on the morning of August 28 and reached its strongest point with maximum sustained winds of 175 mph (280 km/h) and a minimum central pressure of 902 mbar. This made it the fourth-most powerful Atlantic hurricane on record at the time, only to be beaten by Hurricanes Rita and Wilma later in the season. Katrina was also the strongest hurricane ever recorded in the Gulf of Mexico at the time (a record also later broken by Rita). Katrina made its second landfall on August 29 as a Category 3 hurricane with sustained winds of 125 mph (205 km/h) near St. Bernard, Louisiana. At landfall, hurricane-force winds reached outward 120 miles (190 km) from the center, and the storm's central pressure was 920 mbar. After moving over southeastern Louisiana, it made its third landfall over the Louisiana-Mississippi state line. Levees collapsed, leading to massive flooding. Katrina kept its hurricane strength well into Mississippi, but began to weaken later, finally losing hurricane strength more than 150 miles (240 km) inland near Meridian, Mississippi. Katrina weakened to a tropical depression near Clarksville, Tennessee, but its remains were last seen around the eastern Great Lakes on August 31 when it died. The leftover extra-tropical cyclone moved quickly to the northeast and affected Ontario and Quebec. ↑ Swenson, Dan D.; Marshall, Bob (May 14, 2005). "Flash Flood: Hurricane Katrina's Inundation of New Orleans, August 29, 2005" (SWF). Times-Picayune. This page was last changed on 26 March 2019, at 14:06.